From time to time, I offer art workshops. All designs are created by me, and taught using stylish paint colors suitable for actually hanging the art in your home. Sorry, but no rainbow martini glass paintings here! 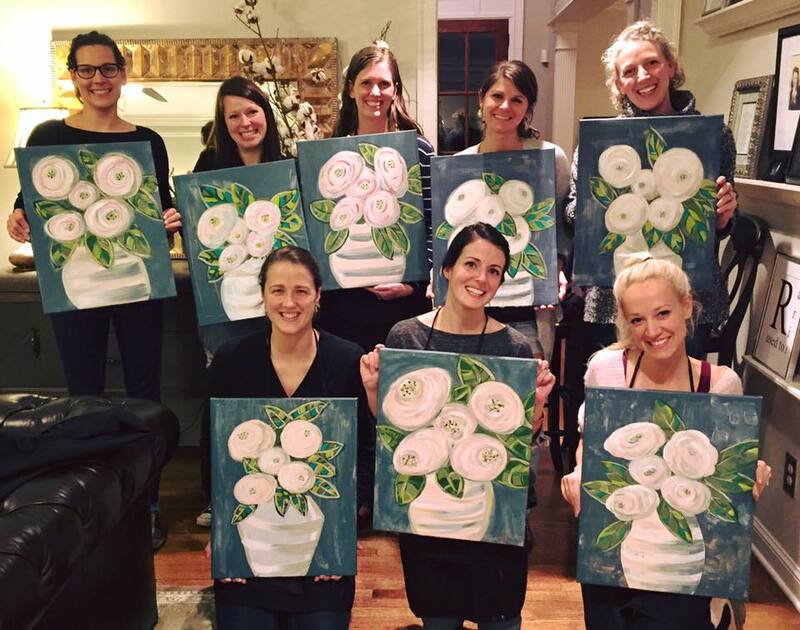 There are several fine places to go take a painting class, but how many instructors come to you and create a custom design for you and your guests? 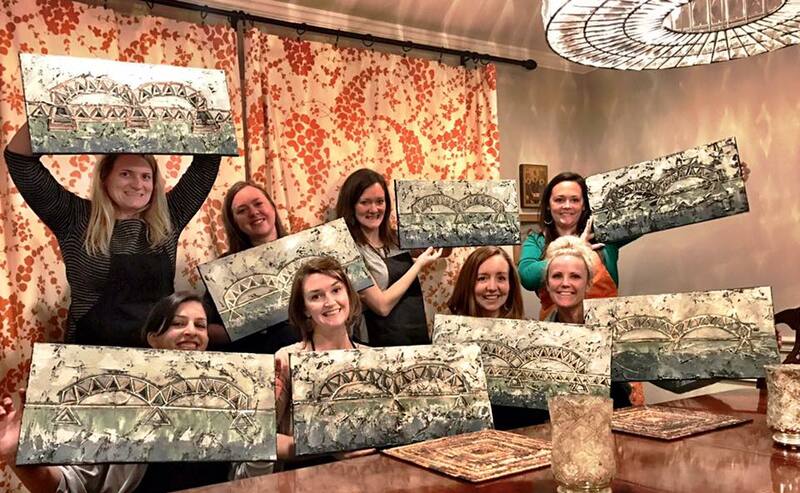 Prior to the event, you and I work together to come up with a custom piece perfect for your group. Or we can use a timeless design I've already created! Contact me here or call me at 901.591.5735 to schedule your event today! I work with you to customize the piece we paint so that it works for your home or office interior. We can do anything - churches, flowers, cotton, Memphis bridges, local city/state art, monograms, seasonally themed pieces, abstracts. You want it...we will do it! The minimum rates for in-home parties, which equate to 10 seats, is $600 for up to 10 people and $50 per additional person. If you have a group of 20 or more, I offer a $5 per person discount. ! My workshops includes up to 2 hours of instruction and a classic 16x20 textured canvas (or other comparable size, as requested). I provide everything needed: canvases, paints, palette knives, aprons, drop clothes, easels, etc. If requested, I will also pre-sketch the basic outline of the subject matter, so your guests can start painting right away! After I receive your email, I will contact you to confirm all details and you can create your own Evite or invitations to send to your friends. I can set up a secure way through Paypal for each guest to submit payment, or you, the hostess may pay for all guests. Once I receive payment from 5 individuals or a deposit of $300, your party is booked! The remainder will be due 48 hrs prior to the party date. Once your party is on the books, you may cancel up to 1 week prior to the event to receive a 50% refund of your deposit. If you must cancel closer to the party, no refund will be given. For any extenuating circumstance, we can make special arrangements. I work with you to customize the piece we paint so that it works for your child and his/her friends' tastes. We can do anything - unicorns, fashion week, sports, superheroes, ets. You want it...we will do it! 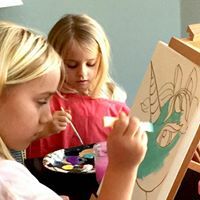 The minimum rates for in-home birthday parties, which equate to 10 seats, is $400 for up to 10 people and $30 per additional person. This lesson includes 1 -1.5 hours of instruction and a classic 16x20 canvas (or other comparable size, as requested). I provide everything needed for the lesson: canvases, paints, palette knives, aprons, drop clothes, easels, etc. 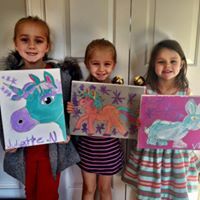 For children, I will also pre-sketch the basic outline of the subject matter, so your birthday guests can start painting right away! For birthdays, we also make a group collaborative piece for the special birthday child which coordinates with the party theme. After I receive your email, I will contact you to confirm all details and you can create your own Evite or invitations to send to your friends. I can set up a secure way through Paypal for each guest to submit payment or you, the hostess may pay for all guests. Once I receive payment of a deposit of $200, your party is booked! The remainder will be due 48 hrs prior to the party date. Once your party is on the books, you may cancel up to 1 week prior to the event to receive a 50% refund of your deposit. If you must cancel closer to the party, no refund will be given. 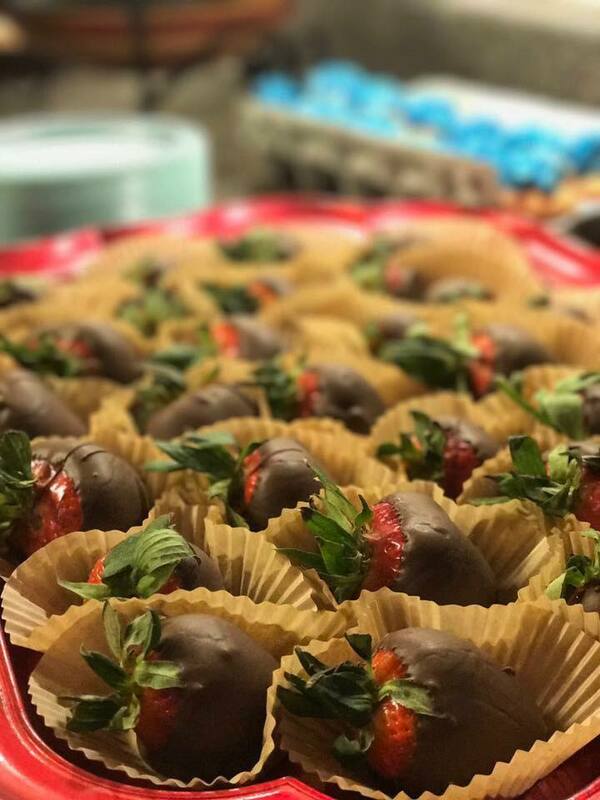 For any extenuating circumstance, we can make special arrangements. Good times, lots of laughs, and works of art! and get the 11th child free!